While the forearms may be less glamorous than showerier muscles such as the biceps, that doesn’t mean forearms exercises shouldn’t be an integral part of your training program. The good news is most weight lifters and bodybuilders don’t have to spend much time doing forearms exercises as the forearms receive a lot of work while training other body parts. This forearms exercise page is devoted for those who are looking to bring their forearm development to the max. Whether your goal is to build muscle or increase grip strength, the best forearm exercises here can help you accomplish your goals. Jump to the Videos of Exercises for the Forearms or continue reading to learn more. 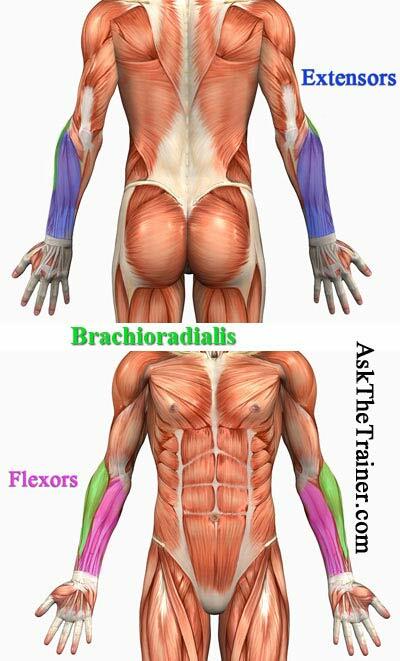 The forearms muscle group is rather simple compared to most other muscle groups in the body. All of the muscles which cross the wrist and elbow joints act during all forearm exercises. The only major forearm muscle which acts at the elbow joint is the brachioradialis. The brachioradialis contracts when you curl your arm. It is most active when you curl your arm with your thumb facing up. There are 8 forearm muscles which extend your wrist. Wrist extension is the same motion as when you lift your hands up such as off of the mouse or keyboard for example. These muscles also move your fingers. Two of them help move your thumb. There are 6 muscles which flex your wrists. Wrist flexion is the opposite motion of wrist extension. An example would be the motion of your wrist when you arm wrestle. Two of the wrist flexors are responsible for finger movement and one is responsible for thumb movement. Fortunately, unless your goals are specifically forearm related you do not have to perform forearm exercises very often or at all. Almost every exercise you perform in the gym with free weights will work your forearms to some extent. When you pick up and hold a weight, your forearm muscles contract isometrically. 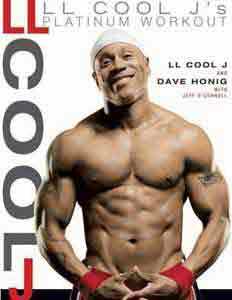 An isometric contraction is when muscles are working but there is no lengthening or shortening. Since the most important job of the forearms is holding weights or your body weight, muscular endurance is more important than strength. Many of the best forearm exercises help you strengthen your grip. The predominant muscle fiber type in the forearms is type I muscle fibers. Type I muscle fibers are highly resistant to fatigue therefore you should use high reps when you perform forearms exercises. You can either do high repetition sets or perform exercises in which you hold the weights the longest. Grip strength will help you get the best results from pulling exercises such as seated rows. You can check out the grips exercises page to find grip strengthening tips. Your forearms and wrist strength is very important for pressing exercises such as shoulder press and bench press. Forearms exercises help you stabilize your wrist. Wrist stabilization is another important benefit of strong forearms. If you have weak wrists it will be more difficult to stabilize the weights. If you cannot stabilize the weights, you will not get the full benefit of pushing exercises. You will also not be able to efficiently work the target muscles because you may suffer due to compensations from the lack of stabilization in your forearms. Forearms exercises can help you increase the size of your forearms muscles. As always, if you want to gain muscle you have to have a nutrition regimen with a caloric surplus as well as put in the time exercising. Since your forearms work significantly during most exercises you should perform forearms exercises at the end of your weight training workout. It is not a good idea to do them at the beginning because your grip will not be even close to 100%. You can perform forearms exercises after any workout day. Since the forearms are predominantly type I muscle fibers they will recover from exercise rather quickly. It is safe to say that you could even perform forearms isolating exercises during every workout. Take note that most exercises which require you to lift heavy weights can help you build and strengthen your forearms. Exercises which require you to use heavy weights such as dead lifts, dumbbell squats, pull-ups, and shrugs are some of the best exercises to develop your forearms. Reverse curls primarily work wrist extensors as well as your brachioradialis. Your wrist extensors have to work a lot as stabilizers during reverse curls. Start: Start from a standing position. Stand upright with your core drawn in, and your glutes contracted tightly. Retract your shoulder blades and keep your elbows in at your sides. Begin the motion: Slowly curl the weight up towards your chin. Make sure to keep your wrists in neutral alignment. You can have them slightly flexed but try to keep them from flexing. If your wrists lose the neutral position, the exercise will not have proper benefits. Lower the weight and try again. Modifications: The EZ curl bar is being used for this video. It is easier on the wrists than a straight bar and you can keep your elbows in towards your side better. You can use a straight bar if your wrists can handle it. You can also perform this forearms exercise on a preacher bench or with a cable machine. When you perform it make sure to keep your body in proper alignment with a tight core and glutes. Hammer curls work your brachioradialis as well as your other upper arm flexors, the biceps and brachialis. Your forearm muscles also work to hold the weight tight. Start: Stand upright with dumbbells at your side. Keep a completely stable core and retract your shoulder blades. Make sure you try to keep your elbows at your side. Grab the dumbbells in the middle and hold tight. Hold the dumbbells with your palms facing away from your body. Begin the motion: Keep your elbows at your side, and curl the weights keeping them upright. Do not rotate your wrists at all. Bring your arms as high as you can while keeping your elbows at your side. Squeeze your arms when the dumbbells are the top, and slowly lower them back down. Modifications: You can perform hammer curls with one arm at a time. Both hands at the same time, saves time, but it is your preference that matters. If you perform hammer curls seated, you will be less inclined to cheat by arching your back and using momentum. 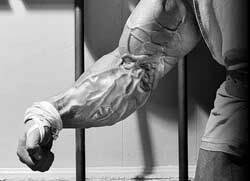 This is the best way to isolate your forearms. This forearms exercise makes your forearms extremely pumped and fatigued. Start: Set up a low cable with a bar which has the ability to rotate freely. Position something to sit on such as a bench or stability ball about a foot away from the bench. Grab the bar and put your forearms on your thighs. Make sure your wrists are directly on top of your knees so your entire forearm is supported by your leg. You can either start with a heavy weight for your wrist flexors or a lighter weight for your wrist extensors. Begin the motion: Make sure you grab the bar tightly and begin curling your forearms. Once your extensors get tired, switch to flexors. You probably want to adjust the weights accordingly for each side of your forearms you are working on. You can perform these curls as fast or as slow as you want to, the end result will be the same. Modifications: If you perform them like the video you will completely burn out your forearms. You can perform wrist extensions separately from flexion if you want. You can do wrist curls with a barbell or dumbbells if you want. Try both and you will see that this set of cable wrist curls is the best forearms exercise. Information about each forearms exercise which can improve your grip the most. Since you are pulling heavy weights your grip and forearm muscles are worked during the pulling best back exercises. If information is confusing, you can find videos only categorized via body part and equipment. Get a custom workout tailored to allow you to achieve your specific goals.